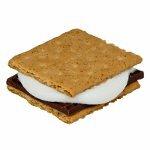 On August 10, make a campfire and indulge yourself with America's favorite campfire treat as it is National S'mores Day. A s'more is a simple campfire dessert which consists of a roasted (sometimes unroasted) marshmallow and a piece of milk chocolate bar sandwiched between two pieces of graham cracker. S'mores have been around since 1920s. The exact origin of the word “s'more” is unclear, though is seems to be a contraction of the phrase “some more”, as in “give me some more”. There are different confections inspired by s'mores such as the Hershey's S'mores bar and s'more flavored Pop-Tarts. If you feel creative, you can celebrate National S'mores Day by making an original s'more inspired dessert instead of or along with basic s'mores. How about a s'mores pizza? Lightly grease a pizza pan. Spread 1 (16 1/2 ounce) package chocolate chip cookie dough into the pan and flatten dough to the edges. Bake at 350 °F until slightly brown (about 10 minutes). Remove from the oven. Sprinkle the top with 2 cups chocolate chips, 2 cups miniature marshmallows, and 2 cups graham crackers, broken into pieces. Return to the oven for another 5-8 minutes. Remove from the oven when marshmallows and chocolate chips are melted and crust is brown. Drizzle with chocolate syrup before serving.